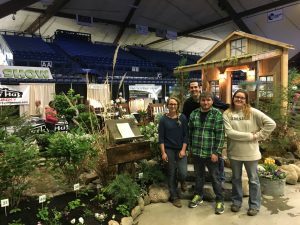 Lindsey Robbins, Angela Masse and Tyler LeBlanc designed and built the landscape exhibit that earned the People’s Choice Award at the 2018 Bangor Flower & Garden Show, this year held April 20, 21, and 22 in the Alfond Arena on campus. The three students were enrolled in PSE 425, Landscape Management, and this was a class project. They worked tirelessly planning, obtaining donated stone and plant material from landscape companies across the state, forcing shrubs into bloom in the greenhouse, building display pieces, installing the exhibit, meeting face to face with the public during the show and dismantling their creation. The hard work, determination and teamwork of Tyler, Lindsey and Angela, all Environmental Horticulture majors, are a testament to the bright futures they have ahead of them! They were mentored on this project by Charlene Gray, the PSE 425 instructor and Program Coordinator for Environmental Horticulture & Sustainable Agriculture programs.